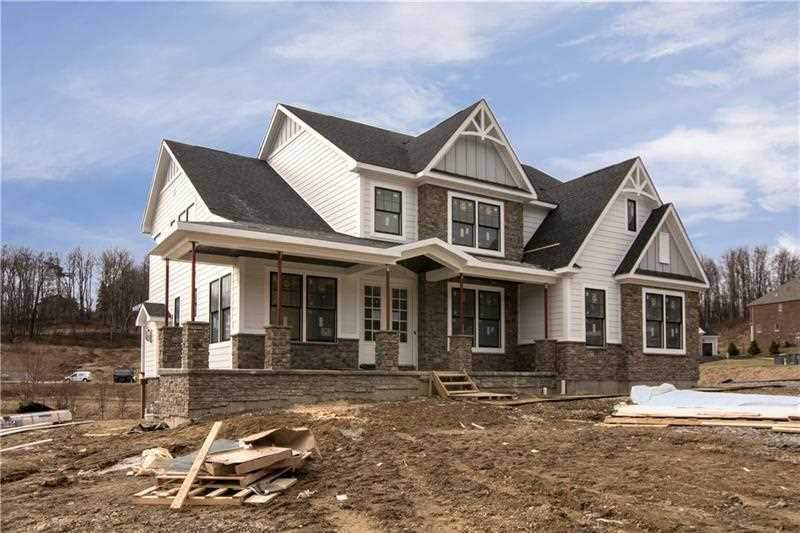 Craftsman style home with app 3400 square feet on first and second floor with another 930 finished in the walk out lower level. Columned covered front porch. Foyer opens to a study with built in shelving and a dining room with a tray ceiling, butler's pantry, wainscoting, crown molding and a paneled columned archway. The great room features a fireplace with stone surround and ship lap, a decorative window with impressive trim and a coffered ceiling. A 2 tone kitchen with white cabinets and accent island with seating, quartz counters, a pantry, with adjacent mudroom, and opens into a sunroom with a wall of windows, a serving bar, wine refrigerator, beamed ceiling. Covered adjacent rear deck is 20 x 12. Luxurious master suite with huge walk in closet, a master bath with corner windows, tray ceiling, free standing soaking tub, furniture style vanities, and so much more! Addt'l three bedrooms have walk in closets, one is en suite. Walk out lower level, crown, french doors onto rear patio. Directions: Rt 19 North, R onto Ehrman Rd, bear left onto Old Ehrman Rd and Left onto Grindstone to the third house on the left. I was searching for a Property and found this listing (MLS #1373897). I would like to schedule a showing for 107 Grindstone Place Cranberry Township, PA 16066. Thank you! I was searching for a Property and found this listing (MLS #1373897). Please send me more information regarding 107 Grindstone Place Cranberry Township, PA 16066. Thank you! MLS # 1373897: This property at 107 Grindstone Place, Cranberry Township, PA 16066 is located in the subdivision and is listed for $859,000. MLS # 1373897 has been on the market for 132 days.